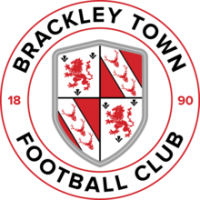 Brackley Town grab all three points in the most lucky of circumstances. 90+4" Brackley score in the last minute of the game, 1-2 Brackley. 90+1" Hancock hits a low central effort into Lewis' arms. 85" Sterling-James dribbles past Williams and releases a powerful shot to Thompson's right but it is wide. 83" Substitution for Altrincham, Richman replaces Hampson. 81" Substitution for Brackley, Sterling-James replaces Baker. 76" Substitution for Altrincham, Harrop is replaced by Hancock. 75" Ceesay hits a powerful effort over the bar. 70" Goal for Brackley Town, Lee Ndlovu taps in at the back post from a Murombedzi cross. 1-1. 67" Corner for the Saints, shouts for a penalty ignored by Michael Barlow the referee. 67" Free kick for Brackley just outside the area. Glen Walker hits it and Thompson saves. 64" Substitution for Brackley Town, Luke Fairlambs replaces Adam Walker. 62" A superb tackle by Harrison denies Brackley the chance to break. 59" Corner for Altrincham, Johnston will take from the left, cleared by Brackley. 56" Johnston's cross once again is close to Hulme but goes past the striker. 54" A fantastic save by Thompson denies Baker's effort. 52" Yellow card for Connor Hampson. 49" Hulme crosses with the outside of his boot but the 'keeper collects the ball. 48" Corner for Altrincham, Johnston will take, Hannigan is held in the box and heads it over the bar. Half time, Altrincham 1-0 Brackley Town. Harrop takes the free kick he earned and hits the ball to the left but a massive deflection in the wall sees the ball go the other way and past Danny Lewis, Alty lead. 37" Altrincham free kick in a dangerous area as Harrop is brought down. 30" Byrne's free kick evades everyone in the box and goes out for a goal kick. 26" Altrincham have a penalty shout of their own but instead a corner is given. 24" Ndlovu attempts an acrobatic attempt but misses the ball completely. 23" Johnston crosses in front of the defence and the pass is whiskers away from Hulme who lunges at the cross. 21" Early substitution for Altrincham, James Jones is replaced by Ben Harrison. 20" Armson's curling effort is over the bar. 18" Hulme and Harrop exchange passes giving Hulme enough time and space to release a low shot into the arms of Lewis. 16" Altrincham begin to control the tempo of the game and are pressing the visitors well. 12" Corner for Brackley Town, Glen Walker to take, headed away by Jones who is also down for a head injury. 8" Hulme is now on the side lines receiving treatment. 6" Hulme is down here, looks like the forward is in agony here. 4" The whole of the crowd here at the J.Davidson Stadium erupt as we saw the net bulge after a shot but it turns out it went out for a goal kick. 2" Corner for Brackley Town after Matt Lowe's cross is blocked, Altrincham clear the danger. Brackley Town substitutes: 12) Myles, 14) Fairlamb, 15) Nti, 16) Jackson, 17) Sterling-James. Brackley Town line-up: 1) Lewis, 2) Murombedzi, 3) G.Walker, 4) Byrne, 5) Hall, 6) Dean (C), 7) Lowe, 8) Armson, 9) Ndlovu, 10) Baker, 11) A.Walker. Altrincham FC substitutes: 12) Poole, 14) Hancock, 15) Chadwick, 16) Richman, 17) Harrison. Altrincham FC line-up: 1) Thompson, 2) Densmore, 3) Hampson, 4) Jones, 5) Hannigan, 6) Moult, 7) Johnston, 8) Williams, 9) Hulme, 10) Harrop, 11) Ceesay. Hello and Welcome to MatchdayLive! Tonight it is once again another important home game, this time against 3rd place Brackley Town, kick off at the J.Davdison Stadium is 7:45pm.